I've got a weakness for salty, savoury, starchy foods. This makes mashed potatoes and gravy one of my favourite holiday indulgences. But what of the leftovers? Let's face it: mashed potatoes don't take well to reheating. This once-delightfully fluffy mass of salty starch is now a stubbornly rubbery brick that refuses to yield to the reapplication of heat. What do we do with such an intransigent leftover? The same thing we do with any nonconformist: tar it and feather it! Or at least the culinary equivalent: batter it and fry it! Part of this woefully incomplete breakfast! You will need 3 medium bowls and a wax paper or parchment-lined sheet pan for the battering process, a thermometer and wok or large saucepan for deep frying, and a wire rack with paper towels for drying. Put the first 1/2 cup of rice flour in the first bowl. 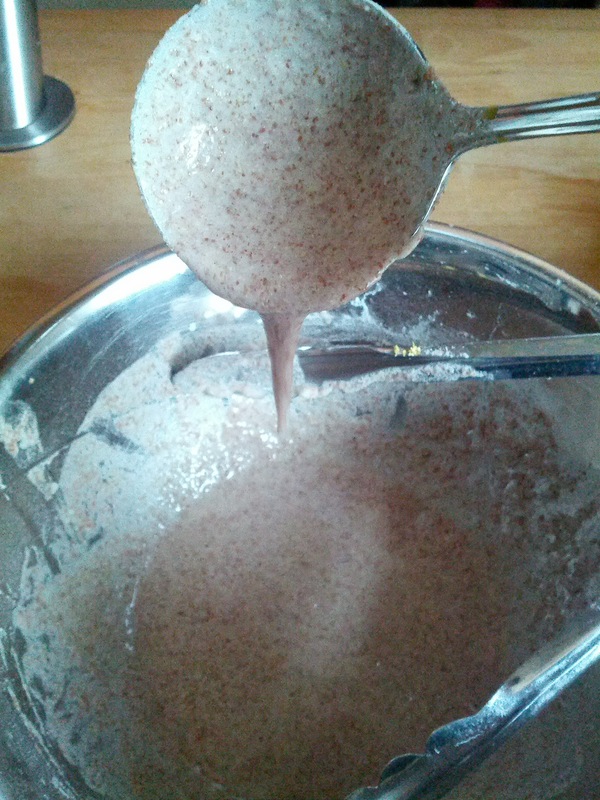 In the second bowl, whisk together the ground flax seeds with the water. Let it sit for a couple minutes and it will take on an eggy consistency. Now whisk in the other 1/2 cup of rice flour and the salt. Add water if necessary to achieve a runny library paste consistency (see photo). In the third bowl, combine the corn meal, nutritional yeast, and sesame seeds. Now roll a golf-ball sized ball of mashed potatoes in your hands and drop it into the rice flour. Roll it around in the bowl to coat it evenly. Move the dusted potato ball into the flax seed paste and roll it around to completely coat it in the paste. Finally, transfer the glue-covered ball into the corn meal, yeast, and sesame seed bowl and roll it around to coat. Move the finished ball to the paper-lined sheet pan. Repeat the above until all the mashed potatoes are used up. 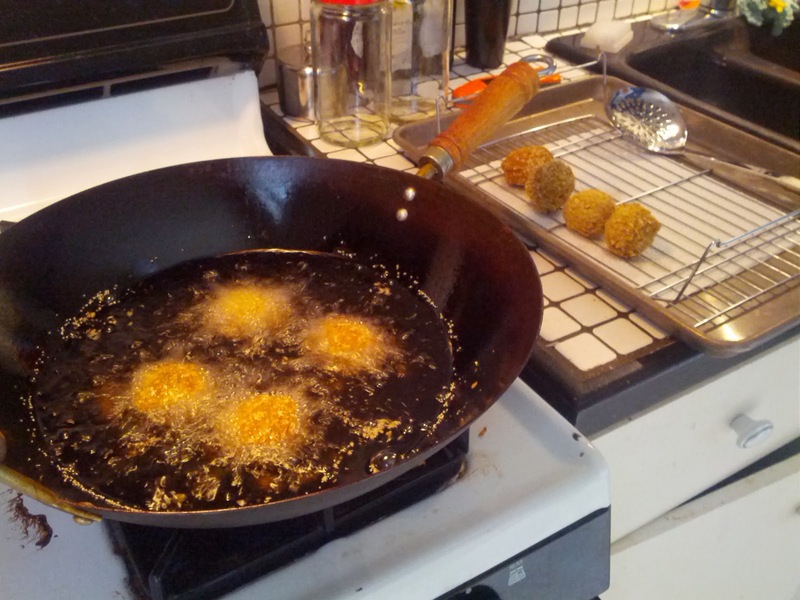 Don't start heating the oil until all the potato balls are battered and lined up on the sheet pan, or you'll be sorry! Okay, now heat the oil to 180°C (350°F). Deep fry the balls 4 at a time. Monitor the temperature of the oil, and adjust the heat to keep it locked in at 180. Cook to an internal temperature of 55°C (130°F), which should take 3 or 4 minutes. Now they're croquettes: golden brown and delicious! Move them to the paper towel-lined rack for cooling. 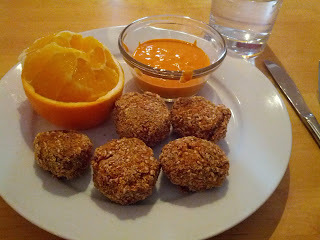 We served these croquettes on Christmas morning with a Sriracha sauce aioli. Yum!